Brian Willson's red polyester biking shorts ended partway up his thighs, revealing knees covered in leopard-print fabric tubes. Below that, matching leopard-print sockets connected to the metal poles where his calves should have been. As Willson spoke, the setting sun shone through the windows of the Mateel Community Center in Redway, illuminating a small circle of plastic chairs in the center of the room. 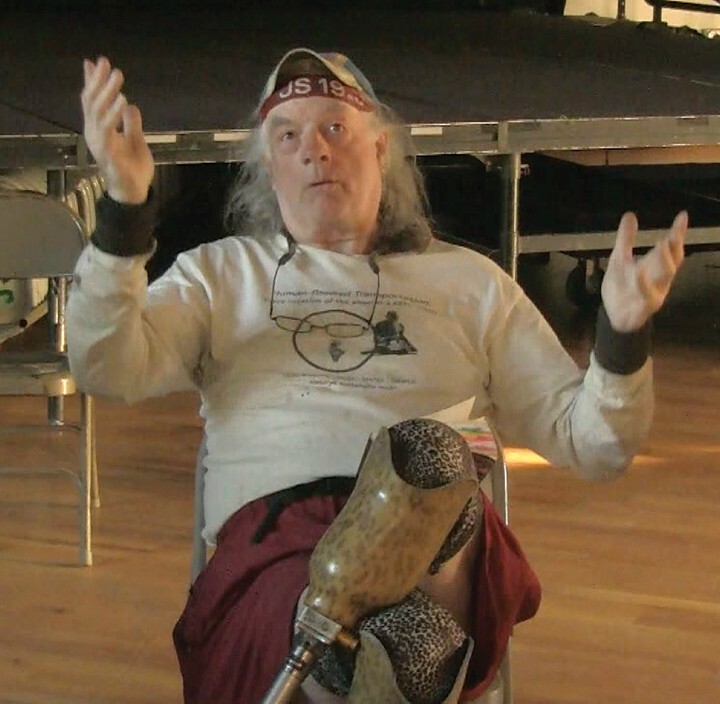 Around 15 people showed up on July 7 to hear his talk -- the reminiscences and reflections of the man who became famous after a munitions train severed his legs during a protest at the Concord Naval Weapons Station. All but three or four of his listeners were old enough to remember Vietnam, and at times their grunts and cheers in response to Willson's words seemed based more on nostalgia than anything else. Both their questions and Willson's responses focused mainly on the past. In some ways, that was appropriate for this visit, part of a hand-powered tricycle tour from Portland, Ore., to San Francisco to publicize his new book, Blood on the Tracks. Wilson calls it an autobiographical look at humanity. The backward-looking questions also seemed to reflect an absence of passion in more recent protests. "I think it's extremely pathetic, weak," said Willson of today's anti-war community. "It's hardly a movement." He blamed a consumer-based society for breeding political apathy. "We've always had resistance movements, but it seems like our addiction to consumption has made us weak, passive," he said. Inevitably, his listeners wanted to know about the day he lost his legs while lying in front of a speeding train. He talked about being squeezed under the cowcatcher, then rag-dolling under the train, leaving his body broken, one leg severed and the other mangled, an ear hanging, skull gaping. Willson, 70, wore a wry smile, as if he were speaking of just a prank he'd pulled way back when. It's been more than 20 years since Willson rose to national prominence by using his body to stop the shipment of American munitions from Concord Naval Weapons Station to Contras in Nicaragua. These days his protests take a milder form -- the book tour by bike, for instance -- but for the few who came to see him in Redway, Willson clearly symbolized a time when American protesters took their anger out into the streets. "I just experienced what people all around the world experienced when they stand up to the Yankee," Willson said of his run-in with the train. His nose was red from long days of biking, and his shoulder-length white hair stuck out from a blue-and-white biking cap. He spoke quietly, gesturing with both hands as he called himself an anarchist and said humanity can only survive by simplifying drastically, returning to a hunter-gatherer system. "It's sad how we're addicted to consumerism. We also believe in our system, which is really destructive," he said. "I think the solution is radical downsizing to a sort of Neolithic society." Willson's activism started during his tour in Vietnam in 1966, when he was tasked with protecting bombers on the ground. When he saw the burnt-out villages and napalm-scorched inhabitants those bombers created, he became disillusioned with the war. Much more than being hit by the train, he said, the things he saw in Vietnam still affect him deeply. When he spoke about his time there his eyes reddened and his voice went soft. Among those listening and sometimes asking admiring questions was Kim Smith, who lives in Arcata. She was one of the youngest members of the crowd, appearing to be in her early 20s. She asked Willson what forms of protest he recommends now, and he agreed with her suggestion that small community-based protests, like tree-sitting, are effective. Willson's actions carried a powerful message to a younger generation, she said. "It inspires me to stand up more," Smith said. "It's very motivating to be your own person." Jim Truitt of Redway also said that Willson inspired him by working in small villages in Nicaragua in the 1980s to build wells and roads, and to essentially serve as human shields, deterring the Contras from attacking the villages. With that in mind, Truitt helped start the Veterans Vietnam Restoration Project, which worked to rebuild infrastructure in Vietnam starting in the late 1980s. "That was an inspiration from Brian," Truitt said. Early in the evening Andy Caffrey of Redway asked Willson what he thought of President Reagan. "Well of course Reagan was a disaster, but really the whole system was a disaster from the beginning," Willson said, segueing back into a discussion of flaws of the consumer culture. Caffrey is running for Congress against Mike Thompson. He said he's known Wilson from when they were both protestors down in Berkeley. The day Willson was run over by the train was a hallmark moment in Caffrey's life. "I was jumping up and down and running around the apartment," Caffrey said. "I just couldn't believe that the world had gotten to a point where they'd let something like that happen."